I’ve decided to blog about something easy (for me, anyway) today. I’ve been sick as a dog for several days, as sick as I’ve been for five or six years (and I’m not fishing for sympathy here – I’m just explaining why this post will be fairly short), and being laid up has given me the chance to finally have a look at a Fritz Opening Trainer DVD I’ve been meaning to peruse: Valeri Lilov’s Unorthodox Chess Openings. The subject of unorthodox openings is one pretty near and dear to my heart; a decade ago I had an Interrant web page on the subject. The Chess Kamikaze Home Page, which won several awards, was a pretty popular site for about five years before I finally shut it down for good sometime around 2003 or 2004; what began as a simple “hobby” site became just too time consuming to maintain. I was a big gambit player for about a decade during that time; my friends used to joke that the only way to keep me from sacrificing a pawn was to glue all eight of them down before the game started. Even though I play precious little chess these days (when it becomes your job, it stops being your hobby), I still believe that gambiteering is really a way of life – it gets in your blood and you never really stop playing (and loving) gambits and offbeat openings. Before we press onward, we first need to define a term: what constitutes an “unorthodox” chess opening? If you ask ten chessplayers you might get ten different answers; to me, an unorthodox opening is simply one which isn’t played as often as mainstream openings (you know – the ones you see trotted out over and over and over again in all the major chess magazines. “Oh, look – another Sicilian Dragon…[yawn]”. Unorthodox openings are generally not as “sound” as those mainstream openings, but are a whale of a lot of fun to play. Some come pretty close to respectability (the Danish Gambit, the Budapest Defense), while others are excellent “surprise” weapons (the Wing Gambit). Some have a very vocal core group of fans who try to convert other players with a near evangelical fervor (the Grob), while others are just plain weird, arguably bad, but make great secret weapons with which to trap an unwary opponent (the Elephant Gambit). The recent Fritz Opening Trainer on Unorthodox Openings is a nice little primer on a wide range of unusual opening choices which runs the gamut of the categories I just described. 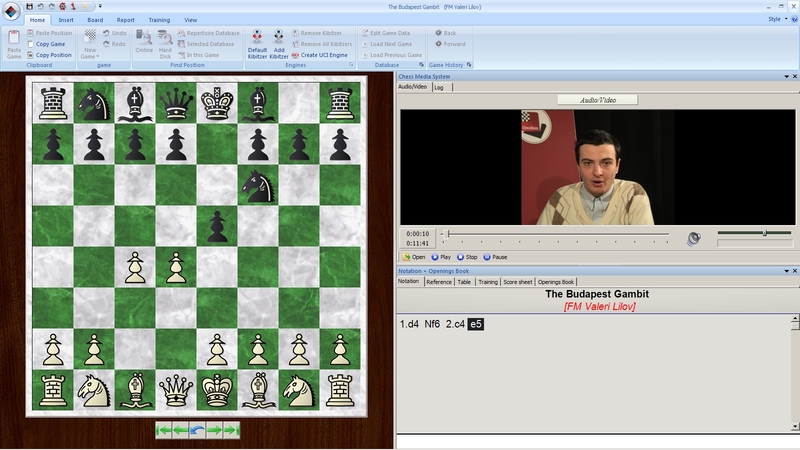 Each opening is explained in a short (typically ten to fifteen minutes) video clip in which the chessboard follows along with FM Lilov’s commentary. You just sit back, watch, listen, and learn the basics of the opening in question. Lilov does a nice job of covering a lot of ground in a relatively short video: each lesson presents the major ideas for both players in that opening. The openings covered on the disk are the Sokolsky, the Dunst, the Double Fianchetto, the Richter-Veresov, Anderssen, Larsen, Grob, Wing Gambit, Fantasy Variation, Chigorin, Center Game, Danish Gambit, Chicago Gambit, Blackmar-Diemer, Omega Gambit, Nimzovich, Hippopotamus, St. George, Gurgenidze, Balough, Kingston, Latvian, Elephant, Greco, Albin Countergambit, Budapest, Tango, Polish Defense, and Englund Gambit. There’s also a final instructional video on opening formations. As always, Unorthodox Chess Openings comes complete with a copy of the ChessBase Reader software, requiring no other purchase or software. However, if you already have ChessBase, Fritz, or any of the other ChessBase-produced playing programs, you don’t need to install the reader software — just use what you’ve already installed. 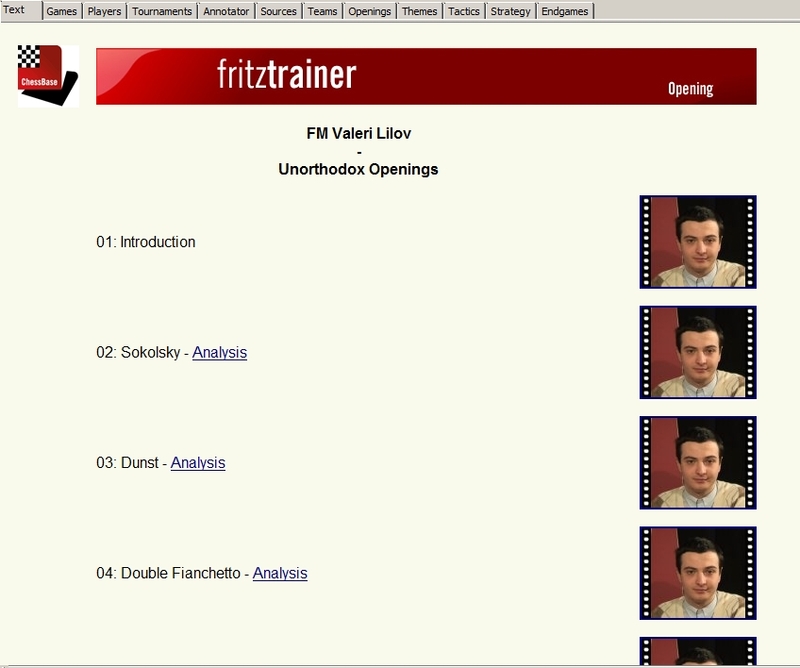 Please note that Lilov isn’t suggesting that all of these openings are 100% sound. The subtext of Unorthodox Chess Openings is the same as that of my old gambit homepage years ago: namely that you can sometimes win with dang near anything as long as you know the opening’s principles better than your opponent does. Believe it or not, even openings like the St. George (widely, and arguably accurately, regarded as a “trash” opening) have defined plans and principles, and these can be devastating surprise weapons in the hands of a well-prepared player against an unsuspecting (and unprepared) opponent. Meanwhile, I’m going back to bed to see if I can shake this chest cold (and to watch more chess videos on my laptop).